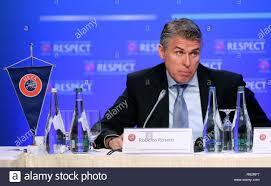 February 7 – With VAR set to make its Champions League debut in next week’s last-16 clashes, UEFA’s refereeing chief Roberto Rosetti (pictured) has stressed it must be used sparingly. UEFA has fast-tracked VAR into the latter stages of the Champions League following its successful implementation at the World Cup, but throughout the European domestic leagues where it has been applied this season, there have been glaring inconsistencies. Rosetti gave a briefing earlier this week to try to explain how and when the technology will be used in order to avoid confusion. He wants to get back to the original idea which was deploy it only to correct match-defining errors. “It is essential that everyone understands when it can intervene, but that they also understand when it doesn’t intervene,” he said.